We enjoyed an excellent family holiday in Kalkan, Turkey a few weeks ago and I will be writing about some of our culinary experiences soon. While we were there, on a couple of occasions, we enjoyed Lamb Köfte cooked on the barbecue. So much so that we brought back some packets of Köfte Harci (meatball mix). The instructions on the packet were in Turkish and German. My knowledge of German is considerably better than Turkish and I worked out that the suggestion was to mix minced lamb and beef together with the spice mix and water. If desired we could add an egg and some parsley. We cooked these on the barbie and served them with fried Aubergines (from our Turkish cookbook) and rice. It was difficult to pinpoint exactly all the herbs and spices that were in the mix, but we could definitely detect cumin. We opened a bottle of red from the Wine Society – The Society’s Chilean Cabernet Sauvignon. This is full-bodied and we tasted black fruits, particularly blackcurrants. This fruitiness was balanced with smooth tannins from oak to give a richness. We thought it complemented the Köfte very well. We finished the remainder of the Yogurtli Kebab Turkish lamb dish from the previous evening (see 12th November). The lamb cubes combine with yogurt, cumin, paprika and tomatoes to produce a delightfully-flavoured dish. We decided to switch to a medium-bodied Australian red – Wild River Cabernet Sauvignon 2002 from Sunday Times Wine Club. This mature red had a cassis sweetness with plenty of fruity blackcurrant flavours. We thought this food-friendly wine went very well with the lamb. 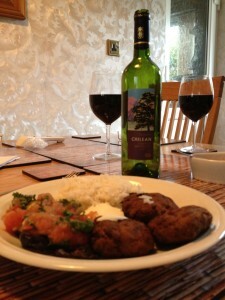 Tonight we enjoyed one of our favourite lamb dishes – Yogurtli Kebab from Supercook. This is a really delicious Turkish dish and is cubed lamb marinated in yogurt, cumin, onion and lemon juice. It is cooked with tomatoes and paprika and served on a bed of toast would you believe? It is quite mildly spiced but full of flavour. We opened a bottle of Torres La Plaza Real Garnacha Syrah 2008 from Sunday Times Wine Club. 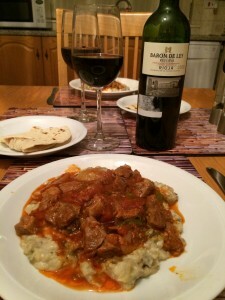 We last had a bottle of this wine with Greek Lamb Stew and really enjoyed it (see 18th August 2011). This Spanish red exhibited cherry flavours, with smooth vanilla and subtle spices. A very good match with the lamb. We had one of our all time favourite meals – Halep Kebab. One of our friends has adapted this recipe from many experiments trying to recreate what he used to enjoy in a small Turkish restaurant in Brighton in the 70s and 80s. This wonderfully flavoured lamb dish contains a powerful tomato and onion sauce with loads of cumin, coriander and chilli. Yoghurt is added at the table to taste and has a lovely cooling effect. I discovered we still had a bottle of Fundacion Carmenére/Syrah 2007. This Chilean red from the Sunday Times Wine Club delivers blackcurrant from the Carmenére, with berry fruits and peppery spice from the Syrah. A lovely rich and powerful mouthful and a brilliant match with the Halep.